A machete is a unique tool that offers many fields of use in different situations. Some are very handy in survival situations while some are awesome in our daily course of life. In whatever situations you may be, there is always a type of it that can be your true EDC tool. Cold Steel katana machete is such an awesome tactical tool that has impressed so many people since its introduction to the world. This cold steel katana review will include the comparative analysis of the katana machete explaining the strengths and weaknesses that this tool has. Our goal is to help you decide wisely before you make a purchase decision. So, let’s start then? We will be dividing the katana machete into its parts to have an understanding of the whole product. So, what are the things that you need to check when you are choosing a machete? At its first impression, this gorgeous looking machete may deceive you by looking like a sword. It’s not! Rather, it’s a machete that mimics the look of a sword. It gives an authoritative power to its owner in such a way that anybody would need to think twice before he tries to mess with them! When you first see it, the katana machete gives you a vibe that it belongs to the museum. It has that antique-like look. You may not agree with me on that, but my feeling is always the same when I take a look at it. Beyond its usability and performance, it can simply be the showpiece tool in your house, that for sure. Besides that aesthetic supremacy, let’s find out the quality of its individual parts. The cold steel katana machete has a relatively large blade length of 24 inches (!) while the overall length is 40 and a half inch. Astonishing, isn’t it? Made in its South African factory, the blade is from 1055 carbon steel. That enables the tool to have great strength in it. 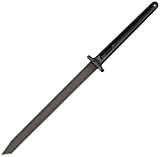 It has the modern tactical tanto point which offers a tough spring temper through a heat treatment process. The blade is straight and has some similarities with Japanese katana. It has a black, baked-on anti-rust matte finish which makes it look like a beauty. The blade is full tang with a long handle for your easy use. Being a full tang blade, the katana offers great strength when you need it. The 2.8 mm thickness of the blade doesn’t limit it in a flexible swing by not having so much forward weight like other heavy kinds of machetes. The 16 and a half inch handle is made by an injection molding process which is pretty long. This extra tough fancy handle can be facilitated by one or two hand use. That gives the machete very good reachability in heavy bushy areas. The handle is made by polypropylene which helps to provide a nice grip for you. It limits the possibility of any slippage for the user. You will get great leverage if you attach a good paracord in the lanyard hole of the tool. It will ensure more comfort and safety while you are giving it a go. The sturdy cross guard of the handle will keep your hand safe from touching the edge of the machete. The machete comes with a regular quality sheath that is made by Cor-ex. The long blade fits in the sheath really well. I wouldn’t say it’s the best quality sheath for this cool blade. The quality could have been improved for the sheath, I think. All in all, it’s just okay. The sheath doesn’t include any straps. But you can always make your own sheath that gives you an extra advantage for your easy use. With that low katana price, I think it’s a cool piece of tool. 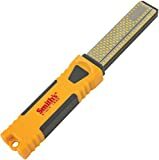 The first thing that this awesome tool does best is it clears any wild bush in an instant in the backyard of your house as well as in the wilderness. It is tough, reliable and gives you great reachability because of its length. This super affordable and modern machete has a really good cutting power. 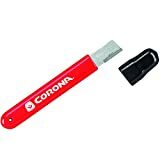 This tool can be used in camping, roaming in the jungle and also cutting and trimming tall trees. It can save you from wild animals as the long blade gives you some advantage in survival situations. The blade can withstand a lot of beating before it turns dull. The blade can be sharpened very easily with the help of any quality stones and can hold its edge for quite a long time. 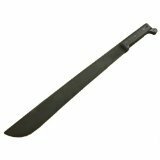 It has all the qualities to be included in any top machete lists. So, why are you waiting for? Can I remove the rivets and grip to allow a custom grip? Answer: Yes, you can do that by drilling out any rivet. Does the machete arrive sharpened? In conclusion to our cold steel katana review, we can say that this magnificent tool really possesses the qualities to be a topper among many other similar items. 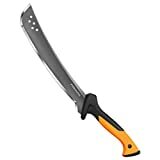 This can be an excellent choice for you when you are looking for a unique and awesome machete. Besides its usability and looks, it has great performance history since its introduction. Apart from its medium quality sheath, it’s a great product without any doubt. We hope this cold steel tactical katana review has helped you out to make the right decision for you. 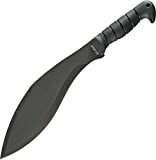 You can also check our top quality machete list to look for other options. There are also many options in cold steel warrior series to pick for you. But, this is the best katana, for sure.